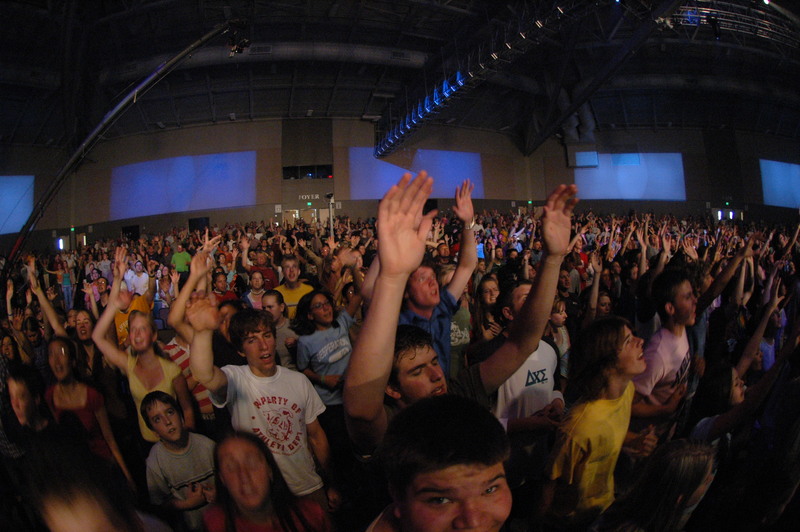 Should Worship Be Physically Expressive? Come on, put your hands in the air! The words echo through both arenas and sanctuaries; they are spoken by pop stars and pastors in concerts and worship services. It’s understandable that people sometimes wonder if worship leaders are simply imitating entertainment culture in asking people to respond. Worship leaders are quick to point to the Psalms’ frequent admonitions to physically express praise to YHWH. But those less inclined to physical expression wonder why they can’t simply ‘worship God in their heart’. After all, are these passages prescriptive—telling us how worship ought to be—or are they merely descriptive—telling us how worship in ancient Israel was? A friend of mine, Richie Fike, raised the question on Facebook recently, querying if people thought the Psalms contained permission, suggestions, or commands to clap, dance, shout, and more. The responses were varied, but as we continued the conversation offline via text, and it got me thinking about the physicality of worship. Let’s take a look at it through three lenses. First, the hermeneutical. The Hebrew Scriptures were broken up into three categories: the Teaching (Torah), the Prophets, and the Writings. The Psalm are not part of the Torah; they are not law or instruction. They fit within the Writings, along with many other books of poetry, wisdom, and allegory. The injunctions in the Psalms to sing, shout, clap, lift up our hands, and more are first culturally contextualized ways of the people of God interacting with their covenant God. But all this is not to say the Psalms cannot teach us. It is, after all, Scripture. It’s included in the Bible for a reason. So, we turn to the theological. What do these passages say to us about God about what it means to be His people? Eugene Peterson makes a compelling case that the five books of the Psalms were designed to correspond to the five books of the Torah. If the Torah is God’s revelation, God speaking to us, then the Psalms are how we answer God. (Peterson writes on this in his excellent short book on the Psalms, Answering God.) Moreover, the Psalms show us how to admonish one another in worship. We call one another to worship; we join with a great company of worshippers; we are never alone in worship and prayer. Finally, the Psalms give us language for prayer and worship. They open up a whole vocabulary for the soul and all of its emotions. Much has been said on this throughout the centuries, but the focus has been nearly always on the words. What if the Psalms do not simply give us language but also give us actions, things to do, ways to embody our worship, prayer, and praise? We are integrated beings. I am not a spirit who has a soul, and who lives in a body (despite the evangelical catechetical chant I grew up rehearsing in church). I am a unified being. Three in one, or something very like it. When two persons interact, they do so on physical, mental and emotional levels simultaneously. Furthermore, one could make a case that as intimacy deepens, so does each dimension—body, soul, and spirit. For example, the New Testament teaches us that becoming one flesh with another is to become one spirit with them. Sexual intimacy is not simply something that happens in hearts; the mingling of souls comes with the intertwining of bodies. There is something of a parallel in our encounter with God: it is not simply a spiritual encounter. Worship is an embodied act; we do not simply worship the Lord in our hearts; we do so with our whole integrated being. But there’s one more thing. We see it when we look through the final lens, the practical. Neuroscience has taught us about something called ‘proprioceptive feedback’. When we physically act in accordance with an emotion, we encourage it. Sing when you’re happy, and your joy will be multiplied. And when we act in contradiction with an emotion, we discourage it. When you’re angry, take a deep breath; slow down; smile; and the anger dissipates. Fine, you might say, but that doesn’t mean that we all confirm or contradict an emotion in the same way. Maybe singing makes your happiness greater, but it doesn’t for me. Well…you’d be surprised. The gestures that correspond to emotion have surprisingly universal application. Sociologists tell us that we mark sadness by a slow walk with a downcast head, and with halting speech in the lower registers of our voice. Anthropologists have studied facial expressions in various global contexts, including those of pre-literate tribes who had no prior interaction with the outside world—and discovered that surprise, sadness, and other emotions meant predictable configurations of the eyes, mouth, and jaw. When you take those two things together—how actions confirm or redirect emotions and how universally applicable many of those actions are—we may find in the Psalms practical wisdom for our worship. * Clap because it awakens your soul to the reality that God reigns victorious; sing because there is more to this life than what we can see; shout because the pain is burning us inside, or because the joy is breaking through; lift your hands because you are empty, because you surrender, because God is on His throne in heaven. And even when you feel none of these things, you may do these things for the feelings may follow. Sometimes, joy needs to be chastened by bowing the knee in confession. Sometimes sorrow needs to be shaken off by dancing in protest of its power. Not all must dance or clap or kneel or sing or shout. And we certainly need not do all these things in every service. The Psalms do not offer us commands about how we must worship; rather, they give us insight into the nature of worship: an embodied act. So the next time your worship leader exhorts you to clap or to raise your hands, remember that she is joining a long line of worship leaders who call us to worship God with our whole beings—with our emotions and with our bodies—and not merely in our hearts. *We certainly cannot extrapolate from studies about gesture and emotion or facial expression and emotion to say that all the physical actions in worship mean the same thing for everyone. They don’t even mean the same thing in different contexts. For example, clapping can display both aggression and joy—in the same culture! But it is enough to make us wonder if there is some wisdom beyond the contexts of the Psalms for clapping, singing, dancing, and more. Thank you for this insightful and well-written post! One of my favorite “studies” is on the physical expressions of ‘praise’ throughout Scripture. I love the idea of a fully embodied worship. I want to roll that one around in some deeper conversation/contemplation. Appreciate the challenge today! Reblogged this on Chattering Churm. Some great thoughts by worship leader Glenn Packiam. Glenn, Love your approach to the question: hermeneutical, theological, and practical. Your insights are solid and helpful. The lingering question for me concerns this expression as part of corporate worship. In some services it seems that we are a group of individuals practicing personal worship rather than the body of Christ worshipping corporately and together. Doesn’t corporate worship imply that whatever we are expressing physically we are all expressing together? I doubt it would be “acceptable” for someone to stand up in the middle of a sermon to ask a personal question because it is a time to listen together to the word preached. So is it any more acceptable for one group of worshippers to be more or less demonstrative in their expression than the rest of the body? Should we not be in it together? Could worship services not provide opportunity for all to be physically expressive, for all to be contemplative, for all to lament, realizing that joining one another in the various modes will at least occasionally take us all out of comfort zone.